This property is ideally situated for accessing both the High Street and the River Annan. Providing spacious lounge open to dining to area, kitchen, two double and one single bedroom - all with built in wardrobes. Modern bathroom with separate shower. Basement with utility area and excellent storage space, access to rear of the house. Patio area and off road parking at rear. Ceiling light, dado rail, carpeted flooring. Ceiling light, smoke alarm. Radiator, carpeted flooring. Window to front with curtain pole and blinds. Ceiling light, TV point, electric living flame fire. Radiator, carpeted flooring. Window to rear. Ceiling light, radiator, laminated flooring. Window to side with blinds. Recessed lighting, smoke alarm. Range of wall and base units, integral oven and four ring gas hob. Sink and drainer with mixer tap, plumbing for dishwasher. Tiled flooring. Stairs to basement rooms. Door to rear garden. Basements rooms (4.30m x 4.15m & 3.36m x 2.87m). One currently used as storage area with power, lights and two radiators. The second room has plumbing for washing machine and a door to the garden. Skylight, loft access, ceiling light, smoke alarm. Balustrade. Carpeted flooring. Opaque window to side. Loft access, ceiling light. Modern suite comprising of corner bath, toilet, wash hand basin and separate shower cubicle with mains fed shower. Heated towel rail, tiled effect vinyl flooring. Window to front with curtain rail. Ceiling light, storage cupboard, built in double wardrobes. Radiator, carpeted flooring. Velux window to front. Ceiling light. Built in double wardrobes. Carpeted flooring. Window to rear with blinds. Ceiling light, telephone point, built in double wardrobes. Radiator, carpeted flooring. Off road parking and enclosed patio area to rear. Mains water, electricity, gas central heating and mains drainage. 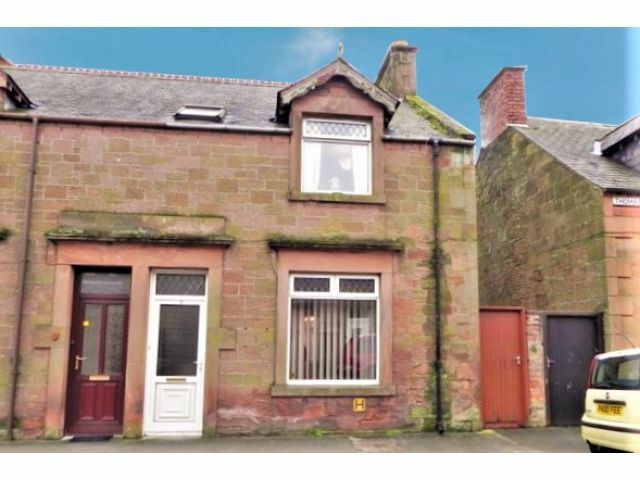 Offers in the region of £105,000 are invited and should be submitted to lj Residential, 93 High Street, Annan, DG12 6DJ or by fax to: 01461 205037. The measurements, are approximate and for guidance only. It is for prospective purchasers to investigate and satisfy themselves as to the basic facts before submitting an offer.